As the first point of contact of a steering wheel, the steering column is a vital part of the system. For heavy-duty vehicles, such as military transporters, trucks or buses, steering assemblies often come with variable design features, depending on the vehicle layout and application. This is the ergonomic hotspot of the steering system, where the subtlest design changes can make huge differences to the ease of steering. Generally speaking, steering columns come in two different varieties; pneumatic or manual. This describes two ways the driver can adjust the steering columns’ tilt and telescope alignment. Pneumatic adjustment uses air pressure to aid movement of the steering column. This is normally found in buses, coaches and commercial vehicles. Manual steering columns, on the other hand, are adjusted using human strength. These are more often found in military vehicles. Tilt and telescope requirements are one of the first factors defined when designing a steering system. A customer may ask for a ten degree tilt for example, depending on the height of the seat and distance from the dashboard. It’s the steering system manufacturer’s job to consider the entire vehicle’s space allowance to ensure this is possible. Ultimately, it’s about making sure the specified range of tilt and telescope is feasible, using CAD software to simulate the interactions with surrounding vehicle parts. But why is a range of tilt and telescope so important? First and foremostly, it’s a legal requirement. The steering wheel must be adjustable to ensure the speedometer is visible to the driver, and that there is enough room between the wheel and the driver’s chest in order for the seat belt and air bag to provide the maximum safety protection. 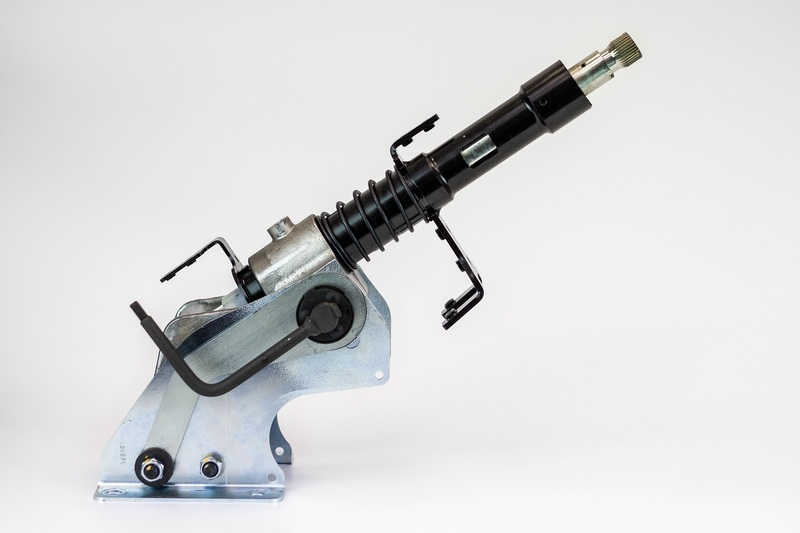 Having a fully adjustable steering column also makes good business sense. For example, if a fleet of coaches isn’t adjustable to meet the requirements of all drivers, employees may end up with strain injuries that result in costly compensation claims. It’s important to get this small, but vital design choice right from day one. Of course, when choosing steering parts that fit together well, it helps to source them from the same supplier. The steering system supplier is then able to assess the system as a whole, to ensure it meets requested tilt and telescope requirements, without concerns over the impact of other parts and components. With the right supplier, vehicle manufacturers can also discuss the compatibility of the steering column with other driving features. For example, steering columns can be adapted to implement steering sensors if required. This could be a sensor cluster within the steering column, containing steering angle sensors (SAS) as part of a vehicle’s electronic stability control (ECS) system. Equally, if the operator is planning to use security items such as locking collars on the steering column, this can also be accounted for early in the design process. This level of design flexibility is only possible through custom steering manufacturing. Suddenly the idea of a customised steering column, designed for the specific vehicle’s needs, is as easy to appreciate as a customised driving seat. After all, steering tilt and telescope is a huge part of driver comfort and ergonomics. It’s time more vehicle manufacturers are in the driver’s seat with regards to steering system design, rather than accepting off-the-shelf parts.